For most of us, seeing a project to completion is a struggle, especially if the timeline of the particular project spans over years. 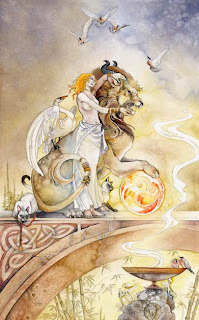 Stephanie Pui-Mun Law is one of my favorite fantasy artists, and when she began her Tarot project in 2004, I was naturally excited to see the finished product. 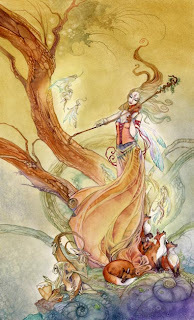 Most of her works are fantasy-themed watercolors, inspired by mythology, legend and folklore. Each picture that she draws is so thoughtfully planned and carefully crafted, with rich colors and astounding details on every level. I love how each image conveys a sense of wonder, love and magic, and I like to simply marvel at each picture until I feel like I have captured every hidden faery and critter. 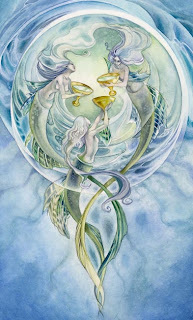 Stephanie began her personal tarot project in 2004. 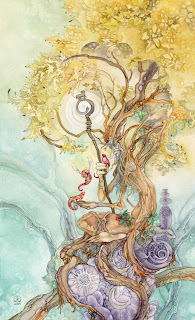 She had wanted to create a tarot deck for almost a decade, but first wanted to improve her artistic skills. She didn't want finish the deck with the first half no longer meeting her standards. The 78-card deck has taken almost 5 years; today, she has one last card to draw. The deck will be completed some time this month and will be printed for Spring 2010. 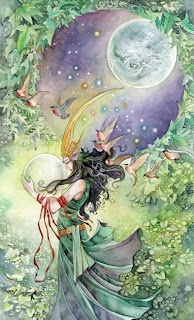 I find each of her drawings incredibly inspiring, but her patience with the tarot project over the years inspires me more! Here, she showcases her creative versitility and amazing ability to create a beautiful and unique compilation that captures the imagination. To our readers: What are some long term projects you have worked on before? How long are you willing to spend on a project? Do you go through phases of experimentation before settling on the finished product? When do you decide to give up?